Welk Aviation is the culmination of its founders vision to deliver the full range of helicopter aviation services at the highest level. For decades, we’ve been known for unparalleled service in electronic news gathering (ENG) and aerial film production, and this success has served as the inspiration to go above and beyond these offerings. As a combined operation, we now utilize our helicopter expertise to provide power line and utility services, run a pilot training school, and manage a tour and charter company. At Welk Aviation, we can handle every helicopter need that exists, to the highest standards in the industry. Given the nature of our business, at Welk Aviation there is simply nothing more important than safety – of our operators, our clients and the public – and whatever service we are called upon to deliver, we are exhaustive in our safety approach. Hand-in-hand with this mindset is the assurance of a superior level of professionalism — a characteristic of Welk Aviation that is instilled in every staff member, across every facet of our company. With Welk Aviation, your experience is always one of comfort and confidence. The quality of our personnel sets us apart from other helicopter operators in the industry, and it is this quality that fosters superior safety – always our primary concern. Our pilots bring thousands of flight hours and years of experience to ensure our clients’ safety. Because Welk Aviation hires from within various aviation professions – including law enforcement, military, fire fighting and motion picture production – we have an impressive lineup of elite pilots. The skills of our pilots are as diverse as our services. Not only do we employ pilots with a tremendous ability to work in live television/news production, motion picture and video production, we also have on our roster seasoned pilots who demonstrate excellence in flying aircraft for critical construction, utility and heavy lifting needs. Welk Aviation became an industry leader through the commitment, experience and competitive nature of its leadership. 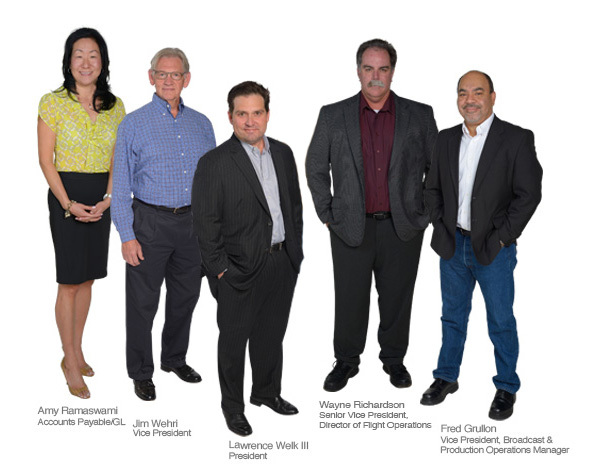 With President Lawrence Welk III in command, our management team can streamline any aerial operation by working creatively, efficiently and safely. 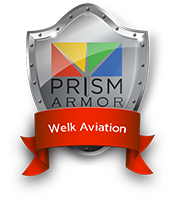 Jim currently serves Welk Aviation in the capacity of corporate analyst and assists in the strategic alignment of operations. With 35 years of experience in the aerospace and space industries, Jim has worked at the executive level, in plant management, engineering and quality positions for Aeroquip, Vickers, Eaton, PSI Corporation and True Position Technologies. He is an accomplished senior executive with a record of success in general management of manufacturing operations, and he has been intimately involved with the development and restructuring of businesses, as well as acquisitions and divestitures. Jim holds an MBA from Loyola Marymount University in Los Angeles. 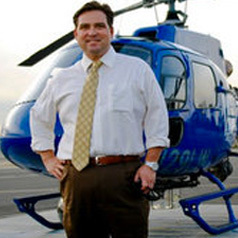 In 1996, Larry was chief pilot and reporter for KCAL Television news, and in 1998 he launched Angel City Air, purchasing helicopters for ENG and production operations around the country. Larry’s vast knowledge and skill, particularly with breaking-news events such as fires, natural disasters and car chases, combined with years of experience in the Southern California aviation community and over 17,000 flight hours, have earned him the reputation as a leader in the aerial ENG and production fields. From 2012 to 2014, Larry also served as president of the Professional Helicopters Pilot Association. Larry has received two Emmy nominations, one Emmy award, a national Sports Emmy award, two commendations from the City of Los Angeles, recognition from the National Broadcast Pilots Association and the Greater Los Angeles Press Club, and many accolades from other media and aviation organizations. He’s assembled the best staff and management team in the industry, and his business philosophy has always been to support both clients and employees with the highest level of care and attention. Wayne began his aviation career as a pilot mechanic, obtaining his A&P mechanics license while working on his helicopter ratings through ATP. He has worked in the helicopter industry consistently since 1985 and has been involved in aviation management since his early aviation career days. Most recently, Wayne held the position of aviation director for Air Methods Corporation, the world’s largest air medical provider. Wayne left Air Methods after 12 enjoyable years to join Larry Welk’s team as director of flight operations. He has held the positions of chief pilot, check airman, director of operations and aviation director. In the last 29 years Wayne has amassed extensive helicopter operational experience with over 11,000 accident-free hours. Fred joined Welk Aviation’s ACA Division in 2011 and has over 25 years of experience in broadcast and production. He manages the staff photographers, directors of photography, and all of the daily broadcast and production needs for Welk Aviation’s clients. Prior to his role at Welk Aviation, Fred’s positions included operations manager for CNN’s western region in Los Angeles and news operations manager for KTNV, the ABC affiliate station in Las Vegas.